The Health Promotion and Wellness (HPW) Coalition is partnering with the Alachua County Sheriff's Office to take part in the DEA's National Drug Take Back Day. Being able to safely and properly dispose of unused and expired medications reduces the risks of accidental overdose and substance abuse. 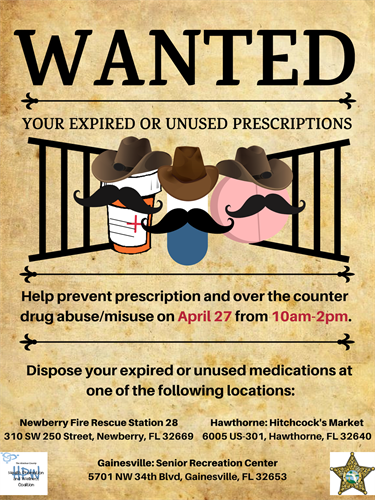 We will be at three different locations on April 27th from 10am to 2pm where people will be able to come by and dispose of their unused and expired medications.